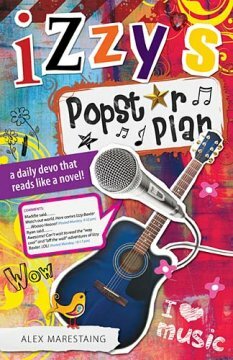 Combining the sense of Hannah Montana with American Idol, Izzy’s Popstar Plan is a self-described “daily devo that reads like a novel”. I’m torn between admiration for the clever way the book attempts to bring Godly character into modern life and disdain for the appeal to the popular mentality of star culture. Especially in light of the current statements from Billy Ray Cyrus regarding his pop-star daughter’s life being ruined by Disney, and the sad life of other teen stars Brittany Spears and Lindsay Lohan, it seems somewhat unwise to encourage those sort of aspirations in any young girl, let alone one who wants to live a Godly life. The book is definitely “light” on spirituality and “heavy” on teen appeal with the story line of Izzy and her experiences in the world of pop music. I see the book as a potentially good segue to spiritual topics with an unchurched young girl, I don’t see it being of much use for children who have a strong spiritual support network. Overall, I was disappointed by the book’s glancing blow at Christian devotional material. A good gift for a young neighbor or family member, I don’t see it as much of an inspirational book for tween girls seeking to learn how to live a more Godly life.